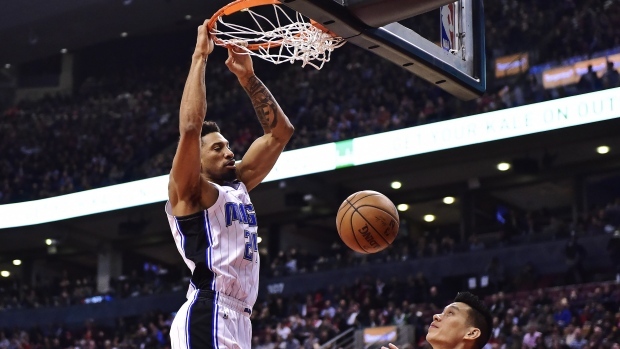 Dwight Walton loves to tell the story about how he met Khem Birch. Walton was coaching a Montreal all-star team he'd assembled to play New Mexico State when the NCAA school was touring in Canada one summer. Birch showed up for the game, dressed ready to play. Walton had never seen the 6-10 Birch, nor even heard of him. He grudgingly let Birch play at the urging of an assistant coach. But he certainly didn't start him. "We got off to a slow start, we're down early in the game, my assistant coach turns to me and says 'Listen Dwight, put Khem in,"' Walton said. "So I reluctantly subbed Khem in. "And we go up and down the floor a couple of possessions, then one of our players takes a jump shot, he misses, the ball comes off the offensive glass, Khem comes flying in for a dunk," Walton continued, the volume of his loud voice rising. "And I was like 'Yeah OK, I'm going to play this guy for the rest of the night.' He was our best player." Walton -- a TV analyst, coach, and former national team player -- will be tuned in Saturday when two players from his hometown of Montreal meet in the NBA playoffs for the first time: Birch of the Orlando Magic, and the Toronto Raptors' Chris Boucher. "The fact that Khem, and hopefully Chris are going to get an opportunity to play significant minutes in a significant playoff series, that's big-time for Canada but specifically for the province of Quebec," Walton said. "And these two are role models whether they want to believe it or not, because it gives (younger Quebec players) hope. "Let's call it as it is, the Ontario players are always the ones who get the spotlight, and to have two Quebecers in the NBA playoffs, from Montreal, it's big-time for me, and I'm very proud." Boucher recently became the first player to earn both the G League's MVP and defensive player of the year awards with Raptors 905. He'd been on a two-way contract, which allows players to move up and down between the NBA and the G League, before the Raptors signed him to an NBA contract in February. He's played in 28 games with the Raptors, capping the regular season with a career-high 15 points and 13 rebounds in Toronto's win Tuesday in Minnesota. "I feel like being on the team this time and not on a two-way (contract) I'm really going to feel (the playoff excitement) more and really try to enjoy the atmosphere, especially in Canada . . . since it's the only team Canada has," said Boucher, who was on a two-way deal last season with NBA champions Golden State. Birch is averaging 4.5 points and four rebounds off the bench for Orlando. He was in the Scotiabank Arena crowd for Game 2 of Toronto's second-round series against Cleveland last year and still remembers the atmosphere. "Oh man, it's crazy and anything can happen in the playoffs," Birch told reporters in Orlando. "Cleveland won that game. Also, you don't ever think that we're going to be there and now we're here." Birch became a dad in January, and his daughter will be at Saturday's game. "Like I've told some people, this is my destiny," Birch said. "Me and my friend talked about this about a month ago. My family is going to see my daughter (for the first time), and my daughter is going to watch me play for the first time. Even though she has no idea what basketball is, just the fact that she's going to be there is going to be special." Boucher's hard-luck road to the NBA is well-told. He dropped out of school at 16 and worked in a Montreal rotisserie restaurant. He floated from home to home, sometimes sleeping on an overnight city bus. He didn't get serious about the sport until he was spotted playing a pickup game in 2012. "When you go through a lot of stuff during your life, you get to be more grateful," Boucher said recently. "So, just everything I've been through before, basketball comes easy. It's a way for me to express myself, be happy and enjoy what I'm doing." "I felt like maybe I had the chance, I just didn't know how long it was going to take, and I didn't know if I was going to come back 100 per cent," he said. "Did I know I was going to get here (to the playoffs)? Probably not. But I'm pretty happy about it." And if Boucher can inspire young Quebec players -- or be "the light at the end of someone's tunnel" as he put it -- he said he's happy to do so. "We have some pedigree there but we always feel like we're second class to Ontario. That's just the way it's always been," Walton said. "So we're going to relish in this opportunity here to have two people from the province of Quebec playing in meaningful playoff games." The Raptors had some bad news Friday, announcing OG Anunoby had undergone an emergency appendectomy on Thursday evening. There's no timetable for his return.